This brand new luxurious modern cruiser has been purpose built in the Maldives, a first of its kind. 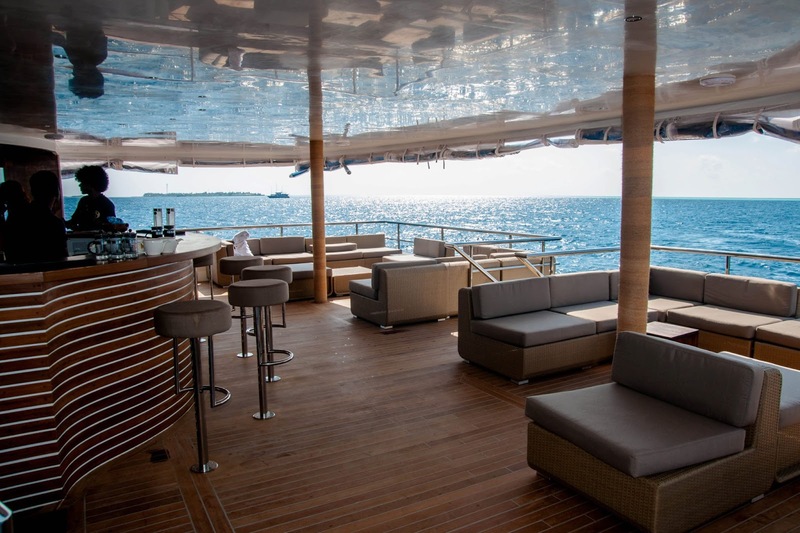 The modern materials used to build and create a spacious, intimate product as well as advanced marine engineering ensure an excellent sea going performance and comfort on board this 50 metre boat. 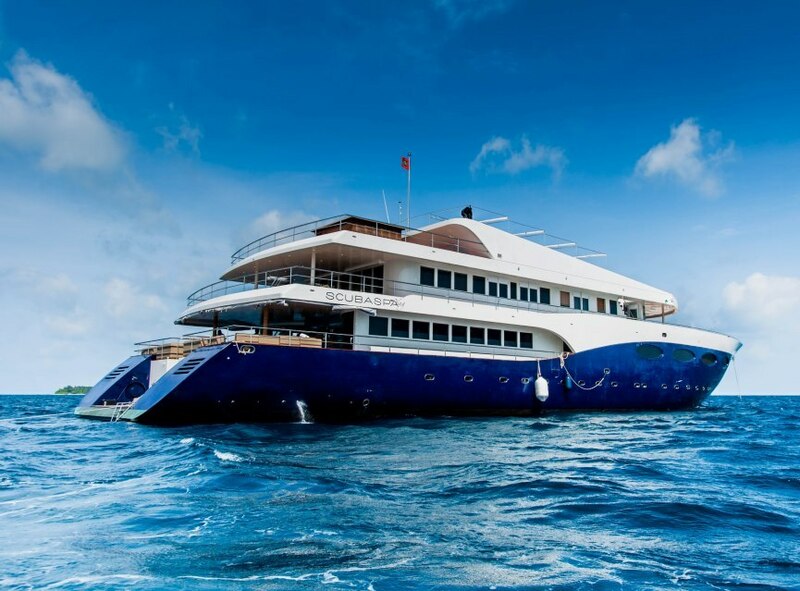 Scubaspa Ying departs Malé each Saturday. Alternating a north and south route, she cruises the central region which includes north and south Malé, Ari, Rasdhoo and Baa atolls. Built to offer the discerning traveller a chance to indulge specific experiences, this unique concept offers a week of amazing diving or relaxing spa treatments on board. It’s something many of you have been crying out for! There are four decks featuring 21 individually styled cabins and suites and facilities akin to that of an island resort than a boat. These include spa treatment rooms, a lounge room, restaurant, bar, bathing areas and a Jacuzzi. All cabins feature air-conditioning and an en-suite shower room as well as modern, luxurious amenities. 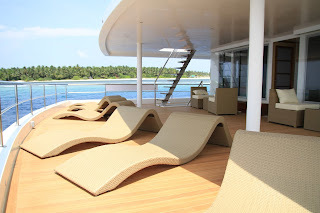 Double/triple bed cabins are found on the lower deck, whilst double/twin suites are located on the main deck offering panoramic vistas from their three metre wide windows. Diving is operated from the accompanying 19 metre purpose built dhoni, fully equipped to provide divers with their own personal space and plenty of comfort. 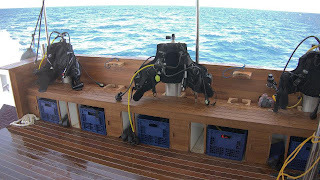 Dive packages include 12 dives (two per day) and are lead by one of four experienced dive crew. 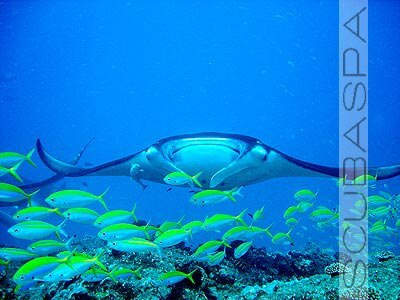 The programme will be decided each week depending on the local conditions, but expect to be amazed at the prolific marine life that abounds in the Maldives from colourful reef fish to awe inspiring whale sharks. The spa is spread over two decks and six treatment rooms. The private Thai massage area is also used for meditation and yoga. A carefully selected team of six professionals are on hand to look after your every need offering massages, aqua therapies, Ayurveda and beauty treatments based on Asian and Western traditions; all carefully selected with a holistic philosophy in mind. Other treatments are available and paid for on board. For those who like to share (or can’t make up their mind) it’s possible to share a spa and a scuba package between a couple and also to try one or the other during your week. Local charges may apply and spa treatments are subject to availability. Each week there will be an opportunity to visit Malé and local islands, go snorkelling or sunset fishing and enjoy time on a deserted tropical island. "Exclusively designed around your total well-being, Scubaspa combines scuba diving on board a luxury safari vessel, immersing you in one of the most beautiful and inspiring oceans in the world, at the same time offering a comprehensive range of the finest treatments in a luxury spa. Every experience, delivered by a team of professionals, is created to give you deep relaxation, tranquility and joy." LAUNCH OFFER – SAVE £300 on all trips in June & July 2013. Offer is on boat only. Last departure from Malé is 27 July 2013. Based on Sea Star cabin, full board meal plan and up to 12 dives or spa treatments per week. Dive Worldwide can arrange your international flights, ask us for further details. Book now - contact the Dream Team call 0845 130 6980 or email us. We offer a comprehensive portfolio of liveaboards and resorts in the Maldives. If this isn't quite you, it's likely you'll find something suitable online.